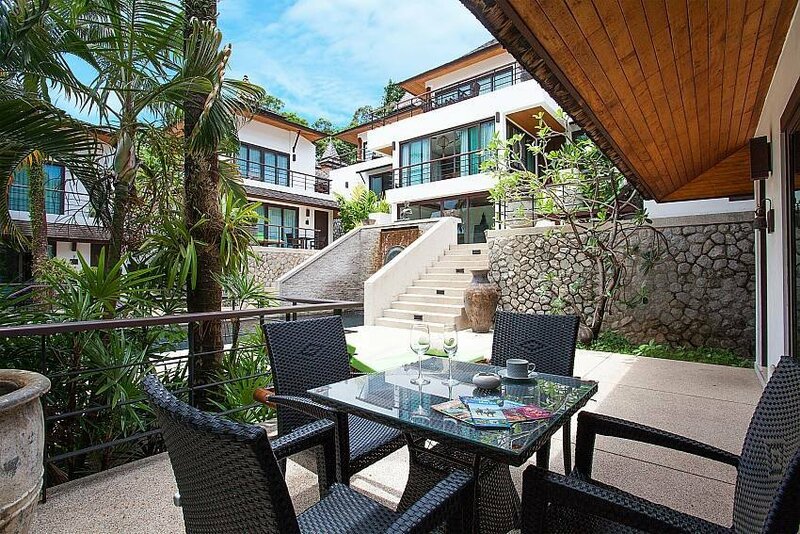 Belonging to a serene resort with some great facilities, this 2 bedroom villa in Central Phuket is all about Asian-style unwinding. The gated resort complex the villa is in is nestled in a hillside location close to a number of attractions. Each house is elevated and overlooking nearby hills and golf courses. On site facilities include two swimming pools with sun lounge areas, and a fitness centre. The villa boasts two private balconies with seated areas. Additionally, one of the balconies features 2 sun beds where you can work on your sun tan with a cocktail in hand. The house has 2 levels, both of which feature lush green views and soothing breezes. The two bedrooms can accommodate a total of 4 people. Each bedroom occupies a single floor; there is also a kitchenette, located on the ground floor next to the master bathroom. In the kitchenette you will find a toaster, kettle, coffee machine, oven, and a small fridge. Each bedroom is fitted with a king size bed, TV, wardrobe with safety deposit box, as well as an en suite bathroom. The master double bathroom comes with a bath tub. The rate includes free internet and daily cleaning service. If you are travelling with more than 4 guests, it is possible to rent multiple 1-, 2- 3- or 4-bedroom villas at the same property. Several word-class golf courses, international and local restaurants, and adventure zip line and wakeboard parks are all within a 10 minute drive away from the villa. A couple of diners and convenience shops are within walking distance as well.